Below you fill find all funeral homes and cemeteries in or near Little Rock. Popular neighborhoods in Little Rock include: Briarwood, Broadmoor, Brodie Creek, Chenal Valley, East Little Rock, Hall High, Hillcrest, John Barrow Addition, Pinnacle Valley, Pleasant Valley, Riverdale, Robinwood, Southwest Little Rock, and Sturbridge. Suburbs of Little Rock: Cammack Village, Cammack Vlg, N Little Rock, Nlr, North Little Rock. Little Rock is also known as: Pulaski County / Little Rock city. Their current mayor is Mayor Mark Stodola. Our family has served families, maybe even yours, at one of the most trying times of their lives. I have seen my grandparents and my parents serve our families with the greatest amount of care and respect given. Memorial Gardens Funeral Home in Sheridan, Arkansas opened to serve the people of Grant County on December 7, 2002. Though our building is new, our caring staff has been in Funeral Service in Grant County, Arkansas for over 40 years. Zip codes in the city: , 72212, 72214, 72215, 72216, 72217, 72219, 72221, 72222, 72223, 72225, 72227, 72231, 72260, 72295. Pulaski County funeral flowers can be purchased from one of the local funeral shops we partner with. There are currently 45 funeral options for this city. Little Rock has been featured in films like: The Other End of the Line (2008), Gone with the Wind (1939), Sling Blade (1996), and Two-Lane Blacktop (1971). Some of the notable people born here have been: Scott E. Parazynski (astronaut), Lil' JJ (comedian and actor), Josh Lucas (actor and film producer), Corin Nemec (actor and film producer), Chris Harris (american football player), Leslie O'Neal (american football player), and Cedric Cobbs (american football player). 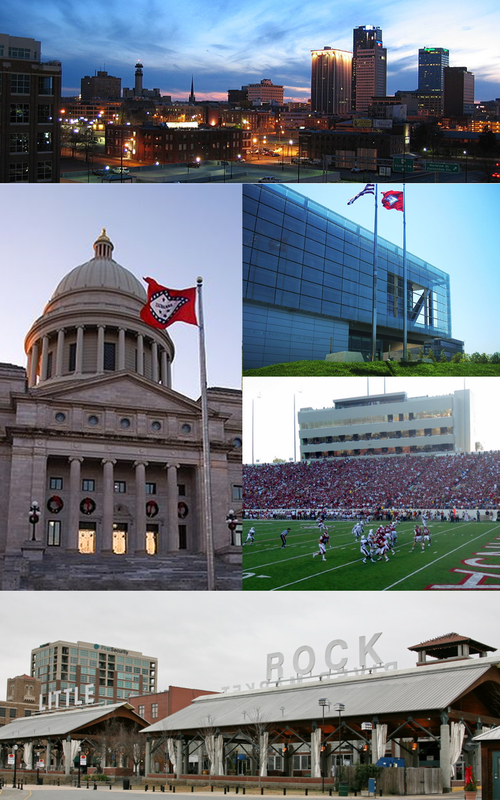 Little Rock is home to the following sports teams: Arkansas�Little Rock Trojans men's basketball. Little Rock is the capital and the most populous city of the U.S. state of Arkansas. It is also the county seat of Pulaski County. It was incorporated on November 7, 1831 on the south bank of the Arkansas River very near the geographic center of the state. The city derives its name from a small rock formation along the river, named "La Petit Roche" by the French in 1799. The capital of the Arkansas Territory was moved to Little Rock from Arkansas Post in 1821. The city's population was 193,524 at the 2010 census. The five-county Little Rock-North Little Rock-Conway, AR Metropolitan Statistical Area (MSA) is ranked 75th in terms of population in the United States with 724,385 residents according to the 2013 estimate by the United States Census Bureau.Little Rock is a major cultural, economic, government and transportation center within Arkansas, the South and the nation. Amenities such as Arkansas Arts Center, Arkansas Repertory Theatre, Arkansas Symphony Orchestra are available in addition to the hiking, boating, and other outdoor recreational opportunities available to residents and visitors. Little Rock's history is also available to residents and visitors in a variety of ways; history museums, historic districts or neighborhoods like the Quapaw Quarter, and historic sites like Little Rock Central High School. The city is the headquarters of Dillard's, Windstream Communications, Acxiom, Stephens Inc., University of Arkansas for Medical Sciences, Heifer International, the Clinton Foundation, and the Rose Law Firm. Other large corporations, including Dassault Falcon Jet and LM Wind Power have large operations in the city. State government is also a large employer, with most offices being located in downtown Little Rock. Two major Interstate highways, Interstate 30 and Interstate 40 meet in Little Rock, with the Port of Little Rock serving as a major shipping hub. It was written by Orange County Register on March 30th, 2019 that Kathryn Ros Rogers died in Yorba Linda, California. Rogers was 85 years old and was born in Little Rock, AR. Send flowers to share your condolences and honor Kathryn Ros's life. It was disclosed by McCook Daily Gazette on February 7th, 2019 that Clay Henry Jr Grizzle passed on in McCook, Nebraska. Grizzle was 64 years old and was born in Little Rock, AR. Send flowers to share your condolences and honor Clay Henry Jr's life. It was reported on February 3rd, 2019 that Lela G Kilmer (Crow) perished in Fulton, New York. Ms. Kilmer was 97 years old and was born in Little Rock, AR. Send flowers to share your condolences and honor Lela G's life. It was reported by Pine Bluff Commercial on January 31st, 2019 that Roy A Rawls passed away in Little Rock, Arkansas. Rawls was 79 years old and was born in Marietta, OK. Send flowers to express your sympathy and honor Roy A's life. It was revealed by Pine Bluff Commercial on January 30th, 2019 that Janice Annette Taylor (Willis) died in Little Rock, Arkansas. Ms. Taylor was 83 years old and was born in Sand Springs, OK. Send flowers to express your sympathy and honor Janice Annette's life. It was noted by South West Times Record on January 27th, 2019 that Betty Lou Prusinsky (Lindstrom) died in Little Rock, Arkansas. Ms. Prusinsky was 79 years old and was born in Chicago, IL. Send flowers to express your sorrow and honor Betty Lou's life. It was written by South West Times Record on January 25th, 2019 that Haley J miss Long passed away in Little Rock, Arkansas. Long was 24 years old. Send flowers to express your sympathy and honor Haley J miss's life. It was disclosed by South West Times Record on January 24th, 2019 that Sharon Kay miss Lashlee passed away in Little Rock, Arkansas. Lashlee was 53 years old. Send flowers to share your condolences and honor Sharon Kay miss's life. It was reported by South West Times Record on January 20th, 2019 that Geneva Irene Hennington died in Little Rock, Arkansas. Hennington was 73 years old. Send flowers to express your sympathy and honor Geneva Irene's life. It was written by South West Times Record on January 19th, 2019 that Caleb Andrew Hanson died in Little Rock, Arkansas. Hanson was 27 years old. Send flowers to express your sorrow and honor Caleb Andrew's life. Planning a funeral can be overwhelming. iMortuary's goal is to provide you with comprehensive listings of Little Rock funeral providers. Browse below to locate Little Rock funeral homes, cemeteries, cremation providers, or to send funeral flowers to a service. Little Rock is not only the capital of Arkansas and the largest city in the state, but is located at almost the exact middle of it. Little rock was named after an early landmark used by explorers. An outcropping of rock designated the end of the Mississippi Delta and beginning of the Ouachita Mountain foothills. The rock was referred to as "La Petite Roche" or "the Little Rock". The official website for the city of Little Rock is https://www.littlerock.gov/. A public memorial service will be held Monday in honor of Oscar winning actress and Arkansas native Lisa Blount ... Blount will be held on Sunday from 5 7 at Roller Chenal Funeral Home in Little Rock. Read more at arkansasmatters.com. Visitation will be held from 2-4 p.m. Sunday at the funeral home. Graveside services will be held at 1 p.m. Monday at Arkansas State Veterans Cemetery in North Little Rock under the direction of Roller McNutt Funeral Home in Conway. Listing all funeral homes in Little Rock, Arkansas so you can easily send flowers to any location (same day delivery) or find any funeral service. funerals in Little Rock, AR 72201 on Yahoo! Local Get Ratings & Reviews on funerals with Photos, Maps, Driving Directions and more. Funerals in Little Rock, AR on Yahoo! Local Get Ratings & Reviews on Funerals with Photos, Maps, Driving Directions and more. We work with local florists and flower shops to offer same day delivery. You will find budget sympathy flowers in Little Rock here. Our funeral flowers are cheap in price but not in value.